An officer in the French cavalry; born in Paris Jan. 20, 1857; died at Porto Novo, North Africa, Nov., 1892. Crémieu-Foa early embraced the military career. The "Libre Parole," the organ of the anti-Semitic party, published in 1892 a series of articles on the preponderance of the Jewish element in the French army. Captain Crémieu-Foa, then garrisoned at Meaux, challenged the editor-in-chief of the "Libre Parole," Edouard Drumont, to a duel, and inflicted upon him a slight wound. Thereupon, the signer of the articles, M. de Lamase, challenged Crémieu-Foa, alleging that the latter should have applied to him for satisfaction. After the encounter between Crémieu-Foa and M. de Lamase, in which four bullets were exchanged without either of the principals being hit (June, 1892), Armand Mayer, one of the seconds of the Jewish officer, a comrade and coreligionist, was taken to task on the spot by the Marquis de Morès, one of the seconds of M. de Lamase, the marquis charging Mayer unjustly with having divulged the contents of the procès-verbal which had been drawn up at the conclusion of the first encounter, and which should have been kept secret. In the subsequent duel between Mayer and Morès, the former was killed. 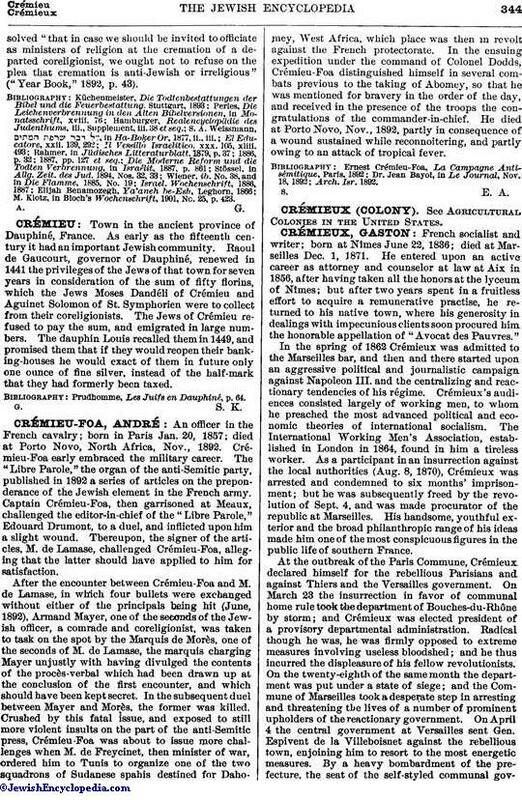 Crushed by this fatal issue, and exposed to still more violent insults on the part of the anti-Semitic press, Crémieu-Foa was about to issue more challenges when M. de Freycinet, then minister of war, ordered him to Tunis to organize one of the two squadrons of Sudanese spahis destined for Dahomey, West Africa, which place was then in revolt against the French protectorate. In the ensuing expedition under the command of Colonel Dodds, Crémieu-Foa distinguished himself in several combats previous to the taking of Abomey, so that he was mentioned for bravery in the order of the day, and received in the presence of the troops the congratulations of the commander-in-chief. He died at Porto Novo, Nov., 1892, partly in consequence of a wound sustained while reconnoitering, and partly owing to an attack of tropical fever.